The NFL playoffs are underway and the opening weekend did not disappoint. Three of the four games were decided by a touchdown or less and all four games were competitive and entertaining. We’re now down to eight teams, and it’s not hard to imagine almost all of them winning this year’s Super Bowl. With four teams out of the running, here are the updated odds on each team winning Super Bowl LII. New England’s Super Bowl odds have increased slightly, perhaps a result of playing the Titans this weekend as opposed to the Chiefs. The recent report that there are problems in New England among ownership, Bill Belichick, and Tom Brady have seemingly had no impact on how the Patriots are viewed. After all, they’ve won 11 of their last 12 games, so if anything is wrong off the field, you can’t tell by what’s been happening on the field. The Vikings have also seen their odds increase slightly during their week off, mostly because two quality NFC teams got eliminated last week. For Minnesota, it’s all about Case Keenum continuing to play at a high level and avoiding turnovers. Heading into the Divisional Round, there should be no doubt that the Vikings are favorites in the NFC. During the bye week, Pittsburgh’s Super Bowl odds actually went down slightly. The drop is likely due to lingering concern about Antonio Brown’s health. It’s also a lock that the Steelers will play the Jaguars, a team that dominated them with their defense during the regular season. If Brown isn’t 100%, that becomes a tough matchup for the Steelers. Despite a win over the Panthers last week, New Orleans saw their Super Bowl odds drop slightly from 5-1 to 6-1. If seeding had held, the Saints would have been road favorites in Philadelphia this weekend. 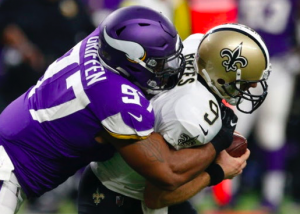 Instead, the Saints have to play in Minnesota against the same stout defense that beat them in Week 1, making their path to the Super Bowl much more difficult. Atlanta’s Super Bowl odds increased significantly after they beat the Rams last week. The Falcons were quite impressive on the road, and now they’ll be road favorites against the Eagles. After an up and down year, Matt Ryan is starting to play some of his best football of the season and could be poised to lead the Falcons back to the Super Bowl. Playing the Falcons instead of the Saints in the Divisional Round actually improved Philadelphia’s Super Bowl odds from a week ago. However, there are lingering concerns about Nick Foles leading the Eagles to wins over two quality teams, even if the Eagles have home-field advantage. But if Foles can play well this week and lead Philadelphia to a win, those concerns could dissipate fast and make the Eagles NFC favorites. For a team that won last week, Jacksonville’s Super Bowl odds didn’t improve all that much. Defensively, the Jaguars were outstanding against the Bills, allowing just three points. However, Blake Bortles was shaky at best throwing the ball. He actually looked better running the ball than he did passing. Of course, the Jaguars aren’t going to survive another game if that’s the case. They need Bortles to play a lot better. Despite their epic comeback over the Chiefs, the Titans still face long odds to win the Super Bowl. Not many teams go into New England and win in January, and even if the Titans do that, they’ll still have another road game after that to reach the Super Bowl. However, if Tennessee can continue running the ball the way they did last week and get a few more magical plays from Marcus Mariota, anything can happen.